No matter how hard you try to avoid getting sick or injured, eventually the seemingly obvious occurs and you are forced to pay your doctor a visit and you will need to get a prescription filled. Of course if you're covered by your work, or you pay for a private insurance plan, then this shouldn’t really be an issue. But for the many Canadians who aren't covered, they have to pay the full cost right from their own pocket. For those living without coverage, prescription costs may feel so exorbitant they may feel tempted to skip or skimp on their medication, which could end up costing them more money than the prescriptions themselves. According to the Government of Canada, prescription medications are the second most costly component of Canadian health care. In 2013, Canadian prescriptions accounted for almost 14 percent (29 billion) of Canada's annual health care spending. This number can definitely seem daunting, but it just goes to show how many Canadians are depended on prescription drugs. But with a little research and some patience, there is a number of simple, yet cost effective ways to save money on your yearly prescription costs. Did you know that each time you get a prescription filled, you are charged a dispensing fee? For many unwary consumers, this might be a hidden cost that they are unaware of. Dispensing fees are not created equally either and can range from $4 to $14 per fill, so this extra cost can really add up over the course of a year. Dispensing fees also vary from pharmacy to pharmacy and by region and store. There also isn't a ceiling on dispensing fees, so pharmacies are able to charge whatever they see fit. So, the next time you are going to get a prescription filled, take a few minutes out of your day and call your local pharmacies to see what they are charging. Just like you would test drive a new car, it is a good idea to test out new medications. If your doctor prescribes a new brand-name drug, chances are they will likely have samples on hand. Ask if you can try 10-14 days worth to see if you can tolerate the new prescription or how you will react to it. There is always the option of purchasing your prescriptions online, which can offer consumers affordable prices no matter where they live. You just need to make sure you are purchasing from certified online pharmacies, such as Canada Pharmacy Online, to ensure that you are buying safe and legal prescription drugs. 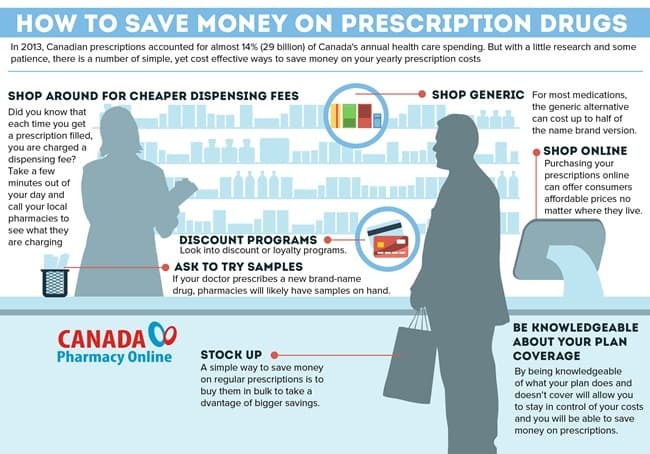 Even Americans are now considering turning to Canadian online retailers to purchase their prescriptions to save on costs. American presidential candidate Hillary Clinton has recently called for the legalization of prescription-pill imports from Canada, following the recent jump in the cost of a life-saving AIDS medicine that went from $13.50 to $750 per pill in a matter of hours. The same pill is available is currently available online in Canada for only $5.28. -What is the maximum that can be claimed per year? -Are there deductibles? Do deductibles differ for different prescriptions? -When does coverage end for children? -Does my plan include travel coverage? -Is there a lifetime maximum for coverage on my plan? By being knowledgeable of what your plan does and doesn’t cover will allow you to stay in control of your costs and you will be able to save money on prescriptions. From food, electronics, and clothing, consumers are often more in favor of paying more for recognizable brand names. But when it comes to prescription drugs, it makes little sense to fork over more money for a brand name, when there are generic alternatives available. For most medications, the generic alternative can cost up to half of the name brand version. According to MedicineNet.com, "Generic drugs are simply copies of brand-name drugs that have exactly the same dosage, intended use, side effects, route of administration, risks, safety, and strength as the original drug." The only obvious differences could include coloring, shape and markings. Another thing to consider is looking into discount or loyalty programs that are available across Canada, for people with and without health insurance. Most are usually free to join and can either save you money or offer you other incentives. -Shoppers Drug Mart: Shoppers offers a free Optimum Points program that you can sign up for. Depending on your province you can earn points on your prescription purchases and redeem the points to save money on regular purchases within the store (excludes redeeming points on prescriptions). -Safeway: Safeway offers a free Club Card to save when you shop both online and in store. For every dollar spent on pharmacy items you receive one point. This includes out-of-pocket costs for new, transferred and refilled prescriptions. Points can be used to save in store and on Safeway gasoline purchases. -Loblaws: Loblaws offers PC Points for every dollar spent in store. You are eligible for points if you download the free PC Points App, or by using a PC Financial debit card. Points can be redeemed in store on groceries. -Costco: Costco is known to have the lowest dispensing fees, but consumers often don’t take advantage of this because they assume they need to have a membership. Memberships are not required for prescription purchases and so anyone is able to take advantage of the cheaper costs. -Rexall: When you shop for prescriptions or medical essentials at Rexall, you will receive one Air Mile Aeroplan reward mile for every $20 spent. You can redeem your Aeroplan Miles on gift cards and other rewards. Air Miles cards are free to sign up for. Another simple way to save money on regular prescriptions is to buy them in bulk to take advantage of bigger savings. Prescription medications do have expiry dates, with most pills lasting anywhere from six months to a year. However, it’s best to verify this with your pharmacist when it comes to your specific medication. Instead of refilling your prescription each month, ask if you can purchase three months worth at a time. So instead of paying 12 dispensing fees a year you’ll now only have to pay for four. By ensuring that you understand what your medical coverage is and following these simple steps, you will be able to make sure you get the absolute best value for the money you spend on prescriptions.